The excesses of Christmas and New Year are done and dusted, and we’re all working through our New Years Resolutions. They might be to have more me time, to exercise more, eat better, or be a little kinder to ourselves. If you have teenage/twenty something children/grandchildren, and they had a resolution to take better care of their skin, or they just want to start the school/university year with clearer, healthier looking skin, the new Nivea Urban Skin range is a great, well-priced start. Nivea Urban Skin is specifically formulated to help protect against the everyday influences of urban life, including pollution, stress, harsh Australian sun and late nights. Giving your skin what it needs, Nivea Urban Skin offers protection and long-lasting moisture during the day, detox and deep cleansing in the evening and intensive moisture and regeneration at night. 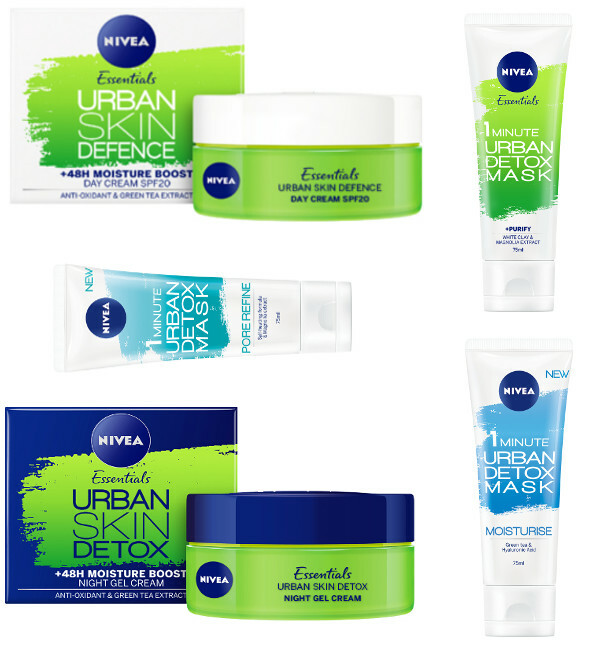 Comprising five easy to use products, the Nivea Urban Skin range helps to ensure skin that is stressed and in need of a little TLC is kept in tip top shape. The Nivea Urban Skin Defence +48h Moisture Boost Day Cream helps to protect skin from external influences, pollution and sunlight with SPF 20. The formula provides skin with up to 48 hours of moisture, and contains green tea extract and anti-oxidants to calm and protect skin. 50ml RRP $12.99. The lightweight formula of the Nivea Urban Skin Detox +48h Moisture Boost Night Gel Cream is perfect for young skin, as it helps to detox your skin overnight leaving it looking healthy, radiant and smooth the next morning. Providing skin with up to 48 hours moisture, the night cream contains bio green tea extract, anti-oxidant and hyaluronic acid, to calm and hydrate your skin. 50ml RRP $12.99. Depending on your skin’s needs, Nivea has three detoxing masks in the range. Nivea 1 Minute Urban Detox Mask – Purify allows you to exfoliate dead skin cells and deeply cleanse your skin. The formula helps to restore your skin’s natural beauty and reduce environmental stressors on skin. Nivea 1 Minute Urban Skin Detox Mask – Pore Refine contains Magnolia extract to help refine with Magnolia Extract. The self-heating, translucent gel formula helps to detoxify skin by reducing environmental stressors and urban pollutants. The mask helps to remove impurities, refines pores and visibly tightens for noticeably clear, smooth and healthy-looking skin. Nivea 1 Minute Urban Skin Detox Mask – Moisture contains green tea & hyaluronic acid to moisturise and nourish your skin. The formula helps to detoxify your skin by reducing environmental stressors and intensively moisturises leaving a radiant complexion. Masks 75ml each RRP $9.97 each.